UCLA currently has 167 single-stall, all-gender restrooms like this one in the UCLA Arthur Ashe Student Health and Wellness Center. The Ashe center now has more than half a dozen such facilities. 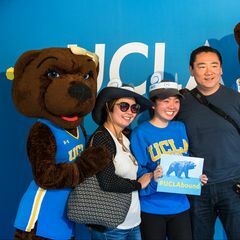 This month, UCLA will mark a milestone in campus diversity and inclusion by opening its 200th single-stall, all-gender restroom. 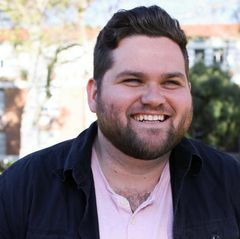 UCLA is believed to have one of the largest numbers of all-gender restrooms of any college or university in the nation, making it easier for people to conveniently find and safely use facilities regardless of gender identity or expression (map), said Raja Bhattar, director of the UCLA LGBT Resource Center. This effort, said Bhattar, reaffirms UCLA as a national leader in its support of lesbian, gay, bisexual, transgender, intersex and questioning students. In September 2014, UC President Janet Napolitano announced a systemwide push to increase the number of all-gender restrooms. At the time, UCLA had nearly 50 such facilities, all single-stall. Since then, UCLA has been converting all existing single-stall restrooms into all-gender restrooms. UCLA currently has 167 (map). When the project is completed by the end of June, there will be approximately 320 single-stall, all-gender restrooms throughout the campus. The cost for Facilities Management to implement this policy is approximately $100,000 for new signage and minor modifications, such as adding feminine product disposal receptacles in former single- stall men’s rooms, and adding interior door locks to any single-stall restrooms that didn’t have them, said Kelly Schmader, assistant vice chancellor for facilities management. The campus has also incorporated all-gender restrooms into plans for all new and renovated UC buildings, where possible, he said. 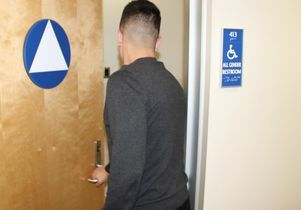 Bhattar said that although this effort is being applauded by many in the UCLA transgender community, it’s important to remember that these facilities are an additional option for users, not segregated spaces. “According to California law, people can use restrooms that align with their gender identity,” said Bhattar. “They are protected by state law and by Title IX. Bhattar said all-gender restrooms are “spaces for anyone who prefers to use a single-stall restroom.” An all-gender facility would also be more accommodating to parents who might not be able to accompany a child of a different gender into a gender-specific restroom or people with disabilities who have an attendant or care provider of a different gender. A single-stall restroom would also be favored by individuals who just prefer to have more privacy. While the campus is legally required to provide a nondiscriminatory environment for students and employees, Kathleen Salvaty, UCLA’s Title IX coordinator, said this effort speaks to UCLA’s unwavering commitment to equity, diversity, inclusion and the creation of a strong and positive sense of community.